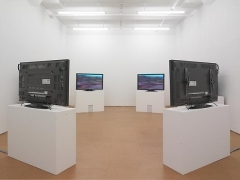 Alexander Gray Associates presented Meadowlark (2008), a six-channel video installation by Ann Carlson and Mary Ellen Strom, in collaboration with Bently Spang. Meadowlark is a meditation on the American landscape as an ecological, political, and visual entity. The video installation reinterprets Frederic Remington’s seminal Western painting, Indian Simulating Buffalo (1908). In Meadowlark, this painting is re-staged as a video on the Northern Cheyenne reservation, to spotlight the rapidly changing landscape of the American West. In this way, Meadowlark presents a critical view of Remington's pictorial narrative, and questions art’s impact on the historic record and the future. Meadowlark’s conceptual impact is heightened through its visual presentation, with six monitors installed in a circular format, referencing Nineteenth-century cycloramas—immersive, room-sized paintings in the round that typically depicted foreign wonders, historical events, or war. Meadowlark was commissioned by the DeCordova Museum and Sculpture Park, Lincoln, MA.